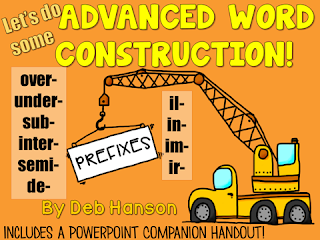 I love to teach the topic of prefixes and suffixes! I have watched my ELLs' vocabulary grow by leaps and bounds after learning the meaning of various prefixes and suffixes. _ _ _ _ _ _ _ _ _ _ _ _ _ _ _ _ _ _ _ _ _ _ _ _.
I FIXED THE POSTER TO THE WALL. Then I underline the word fix, and say something like "What?!?!? I fixed the poster to the wall??? That doesn't make sense, does it? Fix means to repair something that is broken, right?" Someone usually brings up the fact that the word fix could mean something different in this sentence. Eventually we deduce (and verify by looking it up in the dictionary) that fix can also mean to attach two things together. 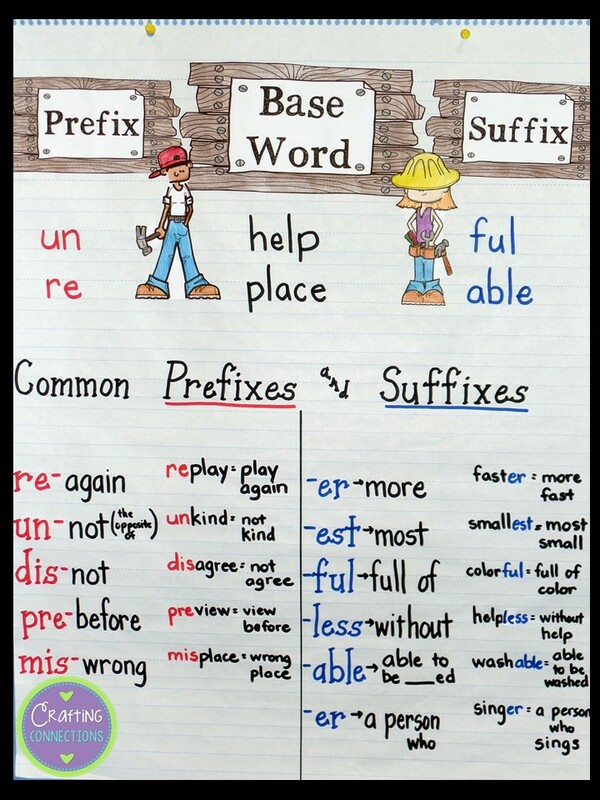 Then I introduce the words prefix and suffix and ask my students, "Now that we know fix can mean "to attach", how can we use this knowledge to understand prefixes and suffixes?" They now seem to clearly understand that prefixes are attached, or fixed before a base word, and suffixes are attached, or fixed to the end of the base word. 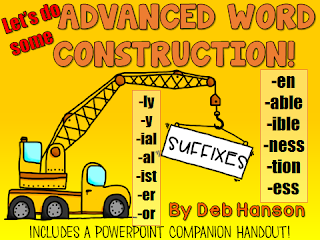 I tell my students that it helps me to visualize a person hammering a prefix and/or suffix to a base word, much like a person fixes a poster to a wall by using a hammer. 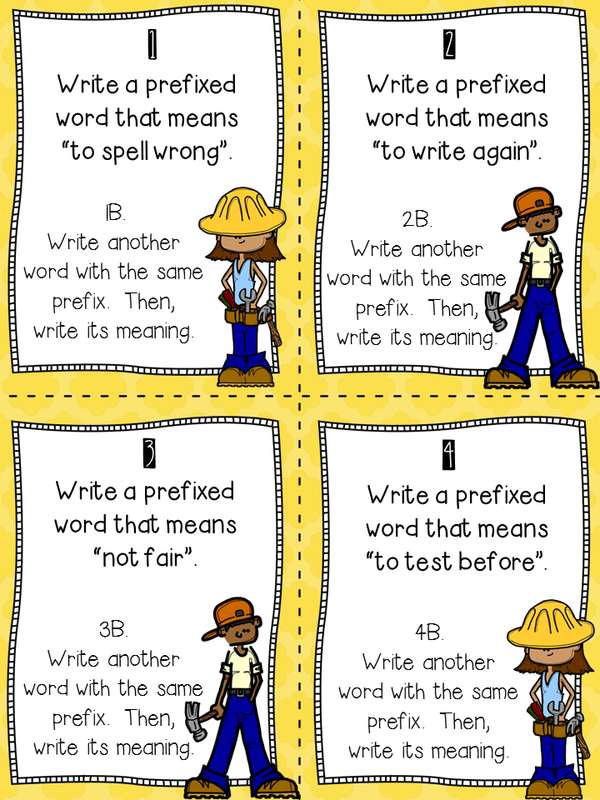 This discussion seems to assist students in their understanding of prefixes and suffixes. After this opening discussion, I like to use the construction theme to further teach my students about prefixes and suffixes. 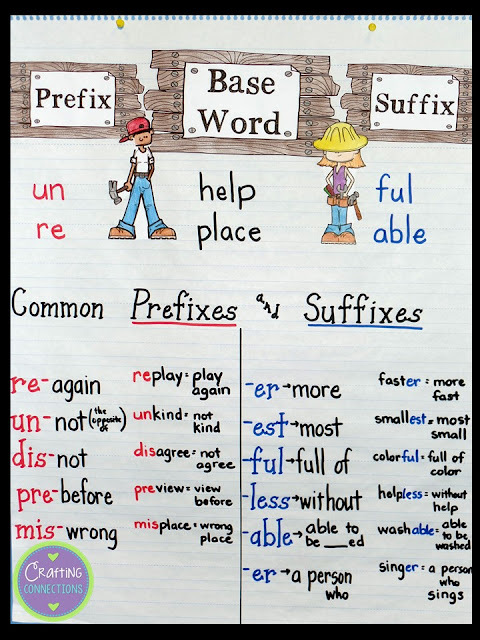 These are the prefixes and suffixes that we covered with our third graders. Clip art by A Sketchy Guy. I created the two PowerPoints shown above for my third grade students. I created the two PowerPoints shown below for my fifth grade students. Finally, I created a matching resource FREEBIE for you! Please download it if you think you might be able to use these 16 task cards (with recording sheet) with your students! 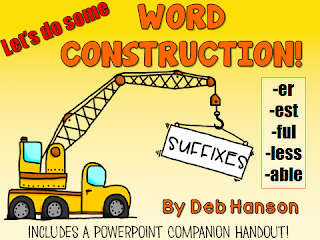 This freebie contains 8 prefix cards and 8 suffix cards. Hi Deb. I love these free task cards - thank you! I'm just curious, do my Morning Meeting messages count as anchor charts? I will have a real anchor chart for this week, but I don't want to break the rules. Yes... definitely! I get lots of ideas from your morning meeting messages! Wow, how exciting!! I am looking forward to great resources and collaboration from the Upper Elementary Snapshot Blog!!! Woot Woot!! Love these affix cards. We create foldable book in my class where we add 10-12 roots, prefixes, and suffixes a month.. We play games with them and use them in our writing.. this set is a great addition!! Thank you so much!! Best of luck friends in your new adventure!! Hi! Do you have the anchor chart headings for sale? I'd love to purchase them! Unfortunately, I can't figure out which font I used!